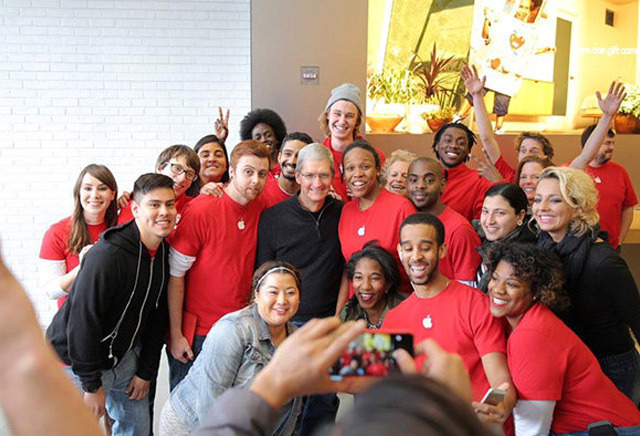 For some workers, Apple Stores don't pay that well, don't leave much room for advancement, and sometimes produce an extremely difficult climate to work in, according to an interview with a U.K. staffer published on Saturday. Staff at the company's U.K. stores, at least, have been hindered by policies preventing part-time people from going full-time, or advancing into management positions, the staffer told Business Insider, preferring to stay anonymous because Apple might pursue legal measures. The company makes retail workers sign a confidentiality agreement preventing many job details from becoming public. "We had between five and eight store managers during my time at the store, of varying kinds," the person said. "Only one of them had started at Apple, the rest had been recruited from elsewhere —from, say, Dixons or HMV." The company reportedly tried to improve the situation with a "Lead and Learn" program, offering hands-on experience in manager duties, but over the course of several years no one was actually promoted at the staffer's store. Base pay at a U.K. Apple Store is said to be about £8 ($11.70) an hour, without any sales bonuses, meaning that many workers can't afford the devices they're selling or will go into debt to do so. While there are job positions that can generate higher pay, such as being a Genius Bar technician, the staffer commented that many of their colleagues hated being a Genius because it involved dealing with angry customers, some of whom would make death threats. Apple Stores are moreover said to feel like a "cult" because of the worship of the company's products and leaders like Steve Jobs, plus policies like "Fearless Feedback," in which workers give very specific positive or negative feedback to their peers at least once per day. The latter is often said to come into play for things Apple wants pushed on customers, like AppleCare warranties or in-store carrier sign-ups, even if they're irrelevant to the individual people clerks are dealing with. A clerk selling someone a Mac, for example, might later be chastised by a manager for not telling the customer about carrier sign-ups for iPhones. Clerks are also expected to develop "personalized" connections with each customer, something the staffer complained can waste time for all involved and actually make it more difficult for customers to get help.